English-language Twitter account of Al Qassam Brigades, military wing of Hamas, suspended. Hebrew and Arabic still up. Al Qassam Brigades, the military branch of terrorist organization Hamas that is in control of Gaza, complained on Thursday that the social media site Twitter has suspended their account. The terror group's English-language Twitter, @AlqassamBrigade, was inaccessible several times over the last week, and as of Thursday still appeared with a "suspended" notice. The group's Arabic and Hebrew Twitter accounts remain unblocked. A spokesman of the terrorists, Abu Obaida, told AFP he blamed Israel for the move, claiming it was "an attempt to wipe out the truth and hide the crimes of the Zionist occupation against Palestinian civilians." Obaida attempted to equivocate between his group, which has even been targeted in Egypt for recognition as a terror group following a string of attacks in the Sinai, and the IDF, which Obaida accuses of "terrorism' and using Twitter to "wage threats." 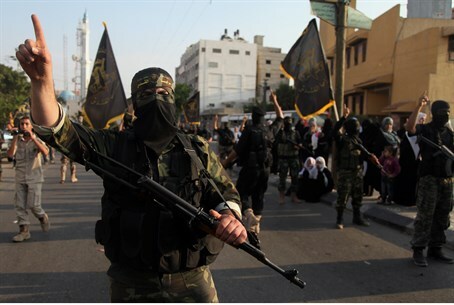 Hamas threatened Israel with genocide last November while saying it was ready for the next battle with Israel, and in December revealed its goal is to conquer Israel and then the world, establishing a global Islamic caliphate system. A Twitter spokesperson refused to "comment on individual accounts, for privacy and security reasons." In Operation Pillar of Defense, Al Qassam Brigades reportedly used its Twitter account to launch a fierce propaganda war against Israel. The ceasefire that resulted from that clash, which was brokered by Egypt, was just last week appraised by security officials to be dead and moot following a barrage of at least 6 rockets from Gaza.